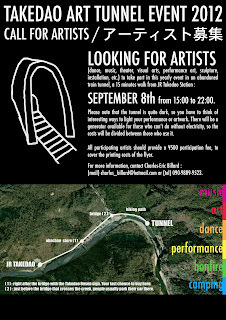 To celebrate the end of summer, I am organizing this yearly art event in an abandoned train tunnel, now used as a hiking path, a pleasant ten minutes walk from Takedao station, Hyogo prefecture. Come and join us for a full day of performances, camping, bonfire, portable fireworks, barbecue and swimming! 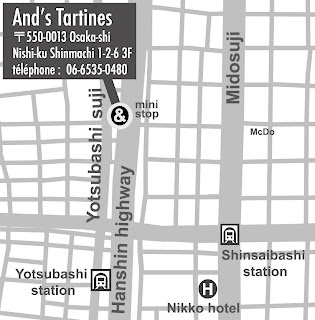 Takedao station is a few stations from JR Takarazuka. 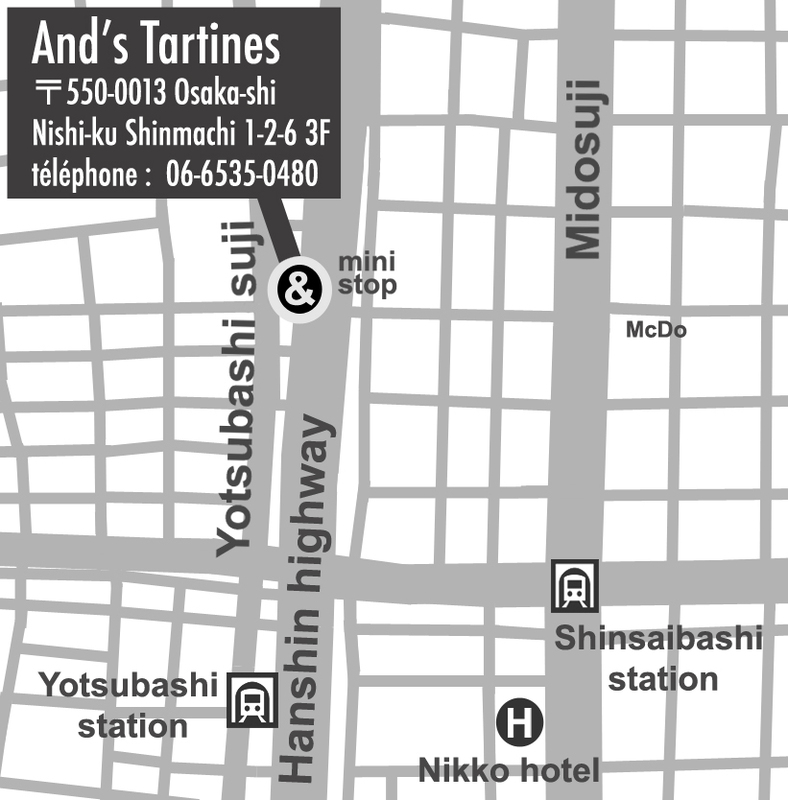 It is on a local line, so if you come from JR Osaka, you may want to transfer to the local line at Takarazuka, which is the closest station on the express. 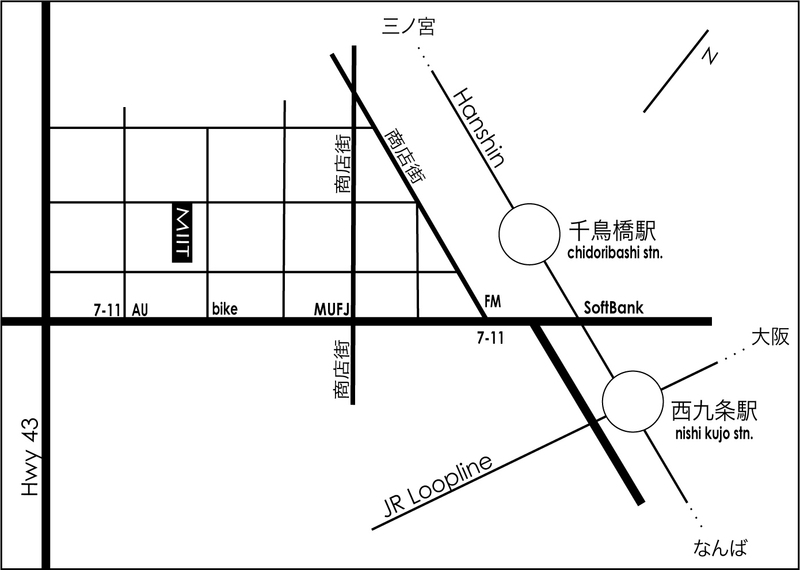 Please use HYPERDIA to navigate yourself. And from Takedao station, turn left when you get out of the station and follow arrow signs I will post. On the way, there will be one little shop next to the first bridge, where you can get beer and snacks, as well as (a little further) a really cool river side restaurant that you might want to check out on your way in or out... Where the road turns left, there will be a bridge. Take that bridge and continue walking along the river. 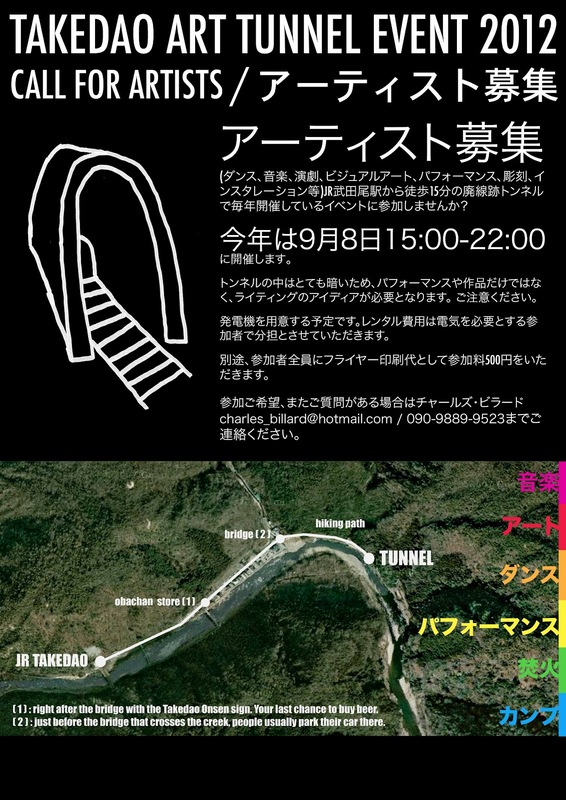 The event is held in the first tunnel. Food and snacks to share would be welcome. If you're planning camping, the gear that goes with it, and for those who would like to do barbecue, a dose of meat would be good. And as Takedao is in the nature, please consider bringing some mosquito repellent. 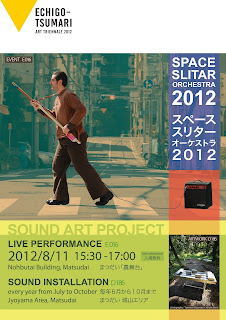 SEPTEMBER 8th from 15:00 to 22:00. 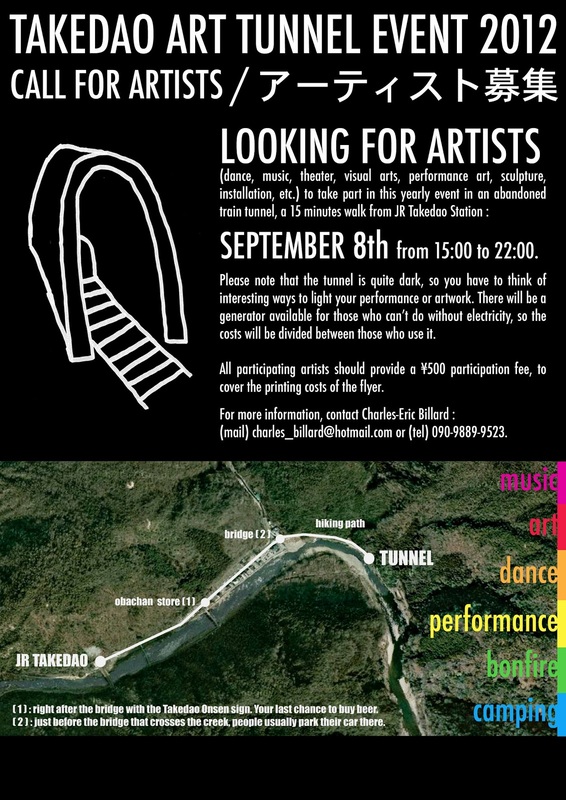 Please note that the tunnel is quite dark, so you have to think of interesting ways to light your performance or artwork. There will be a generator available for those who can’t do without electricity, so the costs will be divided between those who use it. 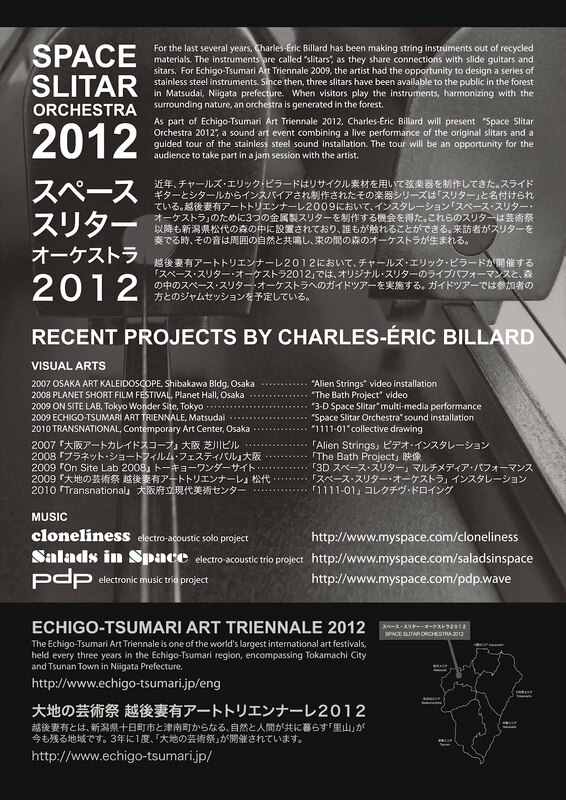 All participating artists should provide a ¥500 participation fee, to cover the printing costs of the flyer. (mail) charles_billard@hotmail.com or (tel) 090-9889-9523. 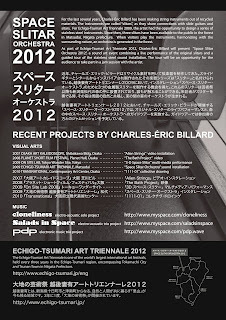 As part of ECHIGO-TSUMARI ART TRIENNALE 2012, multi-disciplinary artist Charles-Eric Billard will present a live performance using original string instruments called "slitars". The word "slitar" is the contraction of "slide guitar" and "sitar", both refering to the inherent characteristics of the string instruments. Originally made of recycled materials like drink bottles and snacks containers, the instruments presented at ECHIGO-TSUMARI TRIENNALE 2009 were made of stainless steel and have been displayed since then as a permanent outdoor installation located in the forest in the vicinity of Noubutai building, the triennale's administrative center. 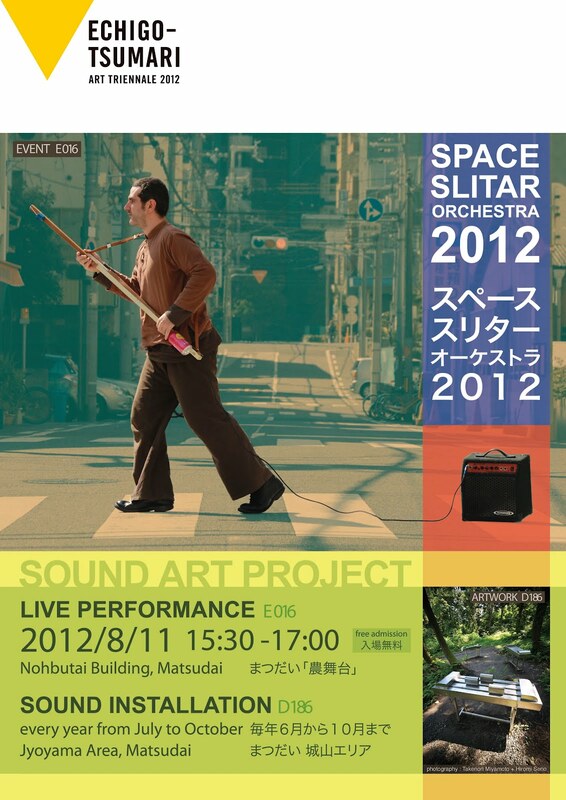 The event SPACE SLITAR ORCHESTRA 2012 will be an opportunity for the public to both experience the sounds of the original instruments and to take part in a jam session with the artist, using the outdoor sound installation. 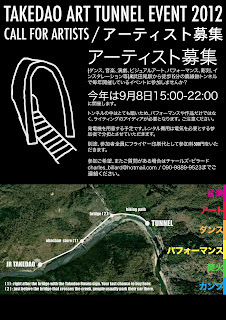 ECHIGO-TSUMARI ART TRIENNALE is one of the largest art festivals in the world and is held in the Echigo-Tsumari region. Since its beginning in 2000, approximatively 160 artworks by artists from all over the world have dotted across a 760km2 area. 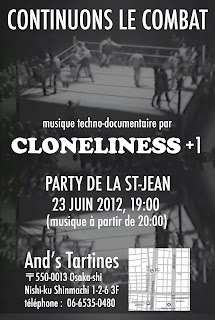 A new independant release of four titles, mostly electronic, with some layering of slitar or other sound devices. "Miniatures Vol.6" June 24th, open 17:00 / performance 18:00 to 20:00 MIIT House 2-6-13 Shikanjima, Konohana-ku Osaka-shi, 554-0012 MIIT blog : http://miit-house.blogspot.jp/ MIIT map: https://maps.google.com/maps?f=q&q=34.684158,135.454712+(MIIT+House) As part of a series of live performances based on the idea of "miniatures", the improvised music duo Smouldering Door (Jerry Gordon & Charles-Eric Billard) will perform improvised music in its most uncluttered version, in collaboration with dancers Keiko Yamaguchi and Yangjah. 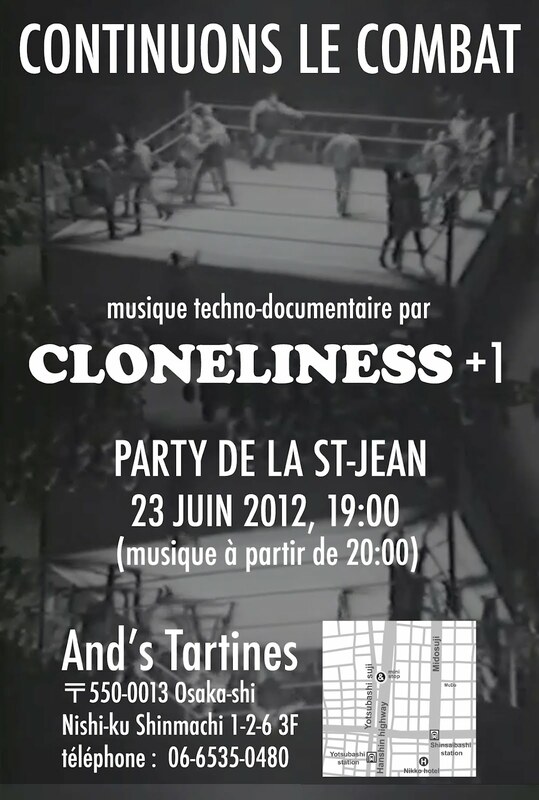 "Continuons Le Combat" June 23rd, event starts at 19:00 / performance from 20:00 And's Tartines 1-2-6 3F Shinmachi, Nishi-ku, Osaka-shi, 550-0013 大阪市西区新町1-2-6 大阪屋ニュー新町ビル3F tel : 06-6535-0480 web : http://andsscenes.seesaa.net/ To celebrate Québec National Day, Cloneliness (aka Charles-Eric Billard) will perform live techno-documentary music. Produced using recorded and possibly live spoken word, electronic beats and self-made instruments, the music project is aimed at making people dance while reflecting about social issues!